The public’s news interests this week are far out of sync with the news media’s coverage: While the aftermath of the Japan earthquake and tsunami was the public’s top story by a wide margin, news organizations devoted far more coverage to the military conflict in Libya. Nearly six-in-ten Americans (57%) say they followed news about the aftermath of the earthquake and tsunami in Japan more closely than any other news last week. Just 15% say they followed news about the U.S. and allies’ airstrikes on Libya most closely, according to the latest News Interest Index survey conducted March 24-27 among 1,002 adults. The public’s news interests are largely unchanged from a week earlier. But news organizations suddenly shifted their focus from Japan to the ongoing military action in Libya. News about Libya accounted for 41% of news coverage this week, compared with just 15% devoted to the Japan crisis, according to the Pew Research Center’s Project for Excellence in Journalism (PEJ). Just a week earlier, news from Japan accounted for more than half (57%) of all news coverage. The past few months have seen an unusual series of major news stories and, in a departure from recent years, most have been overseas stories. In February, the public and news media focused on the extraordinary wave of protests and unrest in the Middle East. The devastating Japanese earthquake hit on March 11 as the rebellion against Moammar Gadhafi gained strength in Libya. According to PEJ, 43% of coverage so far this year has been devoted to international events, double the normal level. With major news unfolding in Japan and Libya last week, two foreign stories topped the News Interest Index for the first time since the first week of July 2007. That week the public’s top stories were the war in Iraq and the string of coordinated suicide bombings in London. Other foreign stories have topped the public’s news interest in recent years, such as the earthquake in Haiti last January, but they generally shared attention with major domestic stories – especially economic and political news. A third of the public (33%) says they followed news about military air strikes in Libya by the U.S. and its allies very closely last week. By contrast, 50% say they followed news about the aftermath of the Japanese disasters very closely. The survey was completed before President Obama addressed the nation Monday night about the mission in Libya. As a point of comparison, there was considerably more public interest in the start of NATO airstrikes against Serbian forces in March 1999 (43% very closely). The current level of interest in Libya is no higher than interest in news about the nation’s economy (36% very closely). But economic news accounted for only 6% of coverage. In other news, 11% say they followed news about the death of actress Elizabeth Taylor very closely; 3% say this was their top story. News about the movie star’s death accounted for 7% of coverage. Similar percentages followed news about the 2012 presidential candidates, though this story received less coverage; 13% say they followed news about the elections very closely, while 2% say this was the news they followed most closely. News about the early positioning garnered just 2% of coverage. Just 8% say they very closely followed news about Egyptians voting on a new constitution. Less than 1% say this was their top story for the week. 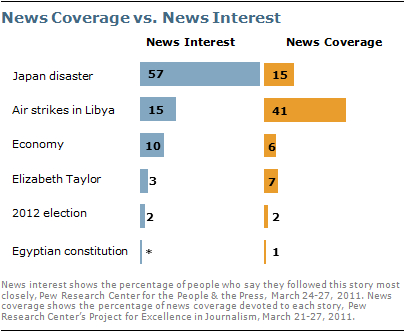 News about the developments in Egypt accounted for 1% of coverage. Public interest and media coverage have been largely in sync on the huge stories that have broken since the start of 2011 – until the allied air strikes in Libya started this month. Both the public and the media focused heavily on the January shootings in Tucson that left six dead and Rep. Gabrielle Giffords severely injured. Public interest stayed relatively high on this story, though coverage fell off more quickly as the media moved on to other developing stories – especially the growing unrest in the Middle East. As the protests swelled in Cairo’s Tahrir Square – along with occasional outbreaks of violence – interest and coverage of the protests in Egypt ramped up quickly. After then-President Hosni Mubarak stepped down Feb. 11, the focus of coverage shifted to unrest elsewhere in the region. The percentage of the public saying they were following news about Egypt more closely than any other news fell off as well. Few closely followed voting last week on a new constitution. After Mubarak resigned, two new stories competed for media and public attention – the protests in Wisconsin over a plan to scale back the collective bargaining rights of public workers and the worsening unrest in Libya. Then the devastating earthquake and tsunami hit Japan March 11. That story has continued to capture the public’s interest as Japan grapples with an ongoing nuclear crisis at a crippled nuclear power complex. 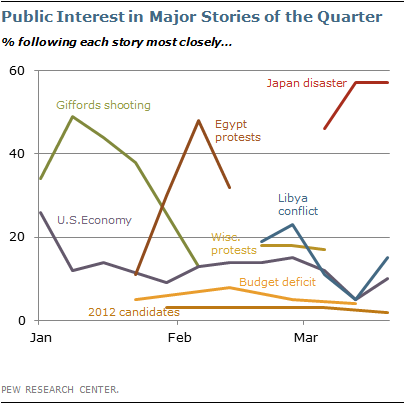 While public interest stayed strong last week, the media focused more on developments in Libya. Last week, foreign news dominated the public’s news interest with more than seven-in-ten saying they tracked either news about Japan (57%) or about allied air strikes in Libya (15%) more closely than any other news. That is rarely the case for this index, which measures public interest in a wide range of stories. Looking at surveys conducted since the start of 2009, interest in international news cumulatively has rarely made up a high percentage of the index. One exception came last month. In mid-February, 48% said they were following developments in Egypt most closely the week that Hosni Mubarak stepped down. In mid-October of last year, 40% said the dramatic rescue of a crew of Chilean miners trapped in an underground mine was their top story of the week. Despite the fast approaching congressional elections, nothing else came close. Interest in the Haiti earthquake last January was comparable to current interest in the disasters in Japan; 57% said they followed developments there more closely than any other news. The week of June 15, 2009, 20% said their top story was the anti-government protests in Iran, while 12% said it was new tensions between North and South Korea. Roughly a third of the public (32%) said they were following one of those stories most closely. The week of April 6 of that year, 20% of the public said they were following news about pirates hijacking ships off the coast of Somalia most closely, 11% said they were following Obama’s trip to Turkey and Iraq and 8% said they were following news about an earthquake in Italy that closely. The following week, 34% said their top story was the Somali pirates, while 6% said it was Obama’s travels to Latin America. 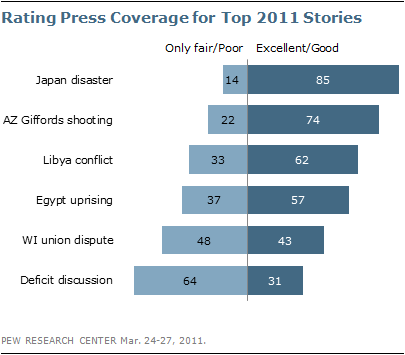 More than eight-in-ten Americans rate press coverage of the earthquake and tsunami in Japan as excellent (43%) or good (42%). Almost as many say the same about coverage of the shooting of Gabrielle Giffords in early January (34% excellent, 40% good). But when it comes to domestic stories focused on economics and politics, the press gets much lower marks. Just 4% say the news media has done an excellent job covering discussions about how to address the federal budget deficit, 27% say coverage has been good. Nearly two-thirds rate the job the press has done as only fair (40%) or poor (24%). Reporting on the dispute in Wisconsin between the state government and public employee unions is rated only slightly better: 11% say coverage of that story has been excellent; 32% say it has been good. About half rate it as only fair (29%) or poor (19%). Ratings are somewhat better for the two of the complex stories unfolding in the Middle East. About six-in-ten say the press has done an excellent (18%) or good job (44%) covering the uprising in Libya and the military air strikes by the U.S. and its allies. A third say the coverage has been only fair (23%) or poor (10%). Coverage of the uprising in Egypt and the political transition there gets similar ratings. Nearly six-in-ten say it has been excellent (16%) or good (41%); 26% say it has been only fair and 11% rate it as poor. These findings are based on the most recent installment of the weekly News Interest Index, an ongoing project of the Pew Research Center for the People & the Press. The index, building on the Center’s longstanding research into public attentiveness to major news stories, examines news interest as it relates to the news media’s coverage. The weekly survey is conducted in conjunction with The Project for Excellence in Journalism’s News Coverage Index, which monitors the news reported by major newspaper, television, radio and online news outlets on an ongoing basis. In the most recent week, data relating to news coverage were collected March 21-27, and survey data measuring public interest in the top news stories of the week were collected March 24-27, from a nationally representative sample of 1,002 adults.